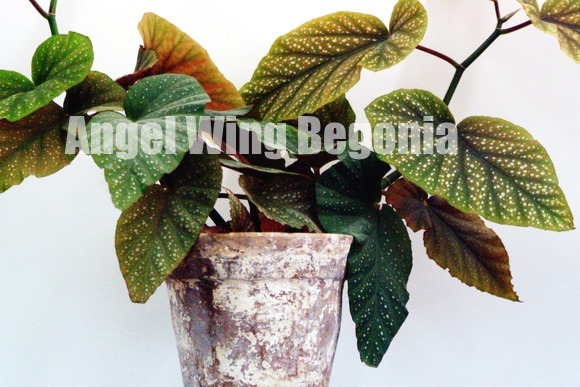 Angel wing begonia house plants are gorgeous year-round. Even when not in bloom, the elegantly shaped begonia leaves cascading down cane-like stems are beautiful. Often spotted with white, the big, glossy green leaves feature reddish undersides. The sprays of delicate flowers are just an added attraction. Bloom time is different for each variety, but most angel wing begonias flower in the spring. Flower colors range from soft pink to deep red. Care is easy, too. This is one of the easiest begonias to grow indoors. Much less fussy about humidity than rex begonias, this member of the family is less challenging to grow. The begonia family owes its name to Frenchman Michel Begon. It includes more than 900 species and thousands more hybrids and cultivars. There are many named varieties. Among the best for growing indoors are 'Bubbles' -- a compact cultivar that blooms nearly year-round...colorful 'Cracklin Rosie' features reddish foliage spotted with rose-pink...'Looking Glass' has stunning silvery green leaves with red undersides. Angel Wings are beautiful, even without flowers. Put them on a pedestal stand to show them off. Repot in spring. Move your plant up to a pot only 1 size larger. 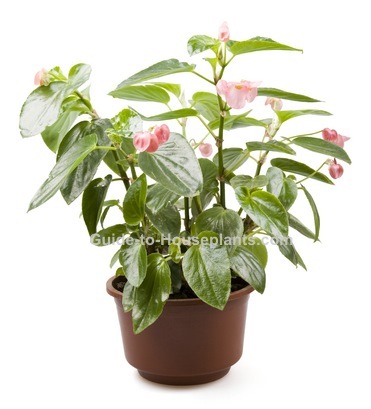 Angel wing begonias have fibrous roots and grow best when slightly pot-bound. Tamp down the soil gently with your fingers so that it doesn't pack too tightly -- begonias like a little air around their roots. Don't overwater. This is probably the only common problem with growing begonias. Using a small pot with a drainage hole will help to prevent overwatering. Allow the soil to dry out slightly between waterings. The beautiful angel-winged leaves will let you know when the soil is too soggy by turning yellow and dropping off. Also watch for yellow halos on leaves. They're a sign of leaf spot -- a bacteria that grows in a moist, cool environment. Cut off affected leaves and be sure your plant has air circulation around it. However, keep it away from heat/AC vents. Light: Give your angel begonia plenty of bright, indirect light. You'll get the best leaf color and more flowers this way. Water: Water thoroughly, allowing the top 1 in (2.5 cm) of soil to dry out between waterings. Humidity: This (mostly) foliage-type begonia is tolerant of average room humidity. However, if the air in your home is dry, use a pebble tray or room humidifier to give it a boost. Grouping tropical plants such as begonias, ferns and orchids also helps to increase the moisture in the air around them. Misting begonias is not a good idea because it can promote powdery mildew and fungal diseases. Temperature: Average room temperatures 65-75°F/18-24°C. Begonias are not cold-tolerant and can be damaged by temperatures below 50°F/13°C. Fertilizer: Feed every 2 weeks in spring and summer with high-potassium liquid fertilizer diluted by half. Take care to fertilize when the soil is already moist to avoid fertilizer burn. Propagation: Stem cuttings root easily. Take 3-4 in (8-10 cm) non-flowering stem tip cuttings in spring or early summer and root them in moist perlite.